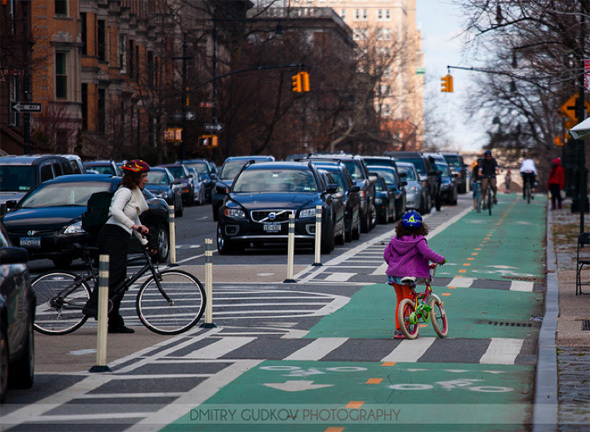 This weekend brought some gorgeous early spring weather to NYC, and the Prospect Park West bike lane was full of people riding bicycles — many of whom probably needed parental permission to go ride on the street. 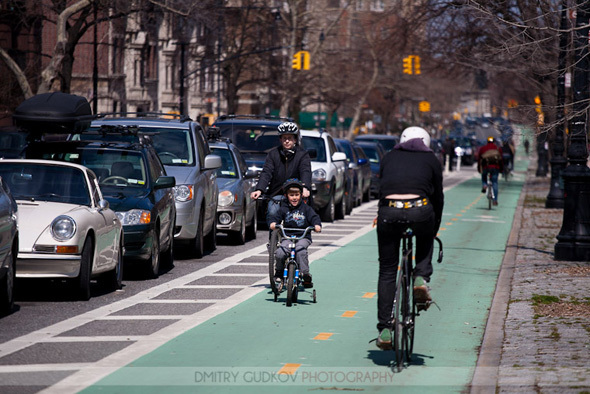 You can kiss family cycling on PPW goodbye if the “compromise” put forward by bike lane opponents — getting rid of the protected bikeway and replacing it with regular painted lanes on PPW and Eighth Avenue — ever sees the light of day. Without the physical protection, Prospect Park West would revert back to becoming a high-speed obstacle course of double-parked cars. Multi-modal transportation in effect. Copyright Dmitry Gudkov, used with permission. Notice that none of these photos shows the dead bodies that pile up routinely in the “car lanes.” For shame, Streetsblog! For shame! The cover-up won’t last forever! Louise Hainline will save us all! This is exactly the kind of media counterattack we need against these selfish NIMBYs. Fantastic photos. My wife and I were among several people who arrived at Saturday evening’s “Toast to Tupper” Prospect Park gala on bikes via the PPW path. When we got to the valet parking drop-off, they didn’t quite know what to make of us. She was able to check her folder with her coat, but I had to lock up to a sign post. First time I ever got applause from pedestrians walking along the park — you think it was the tux? In the first photo, the ladies with the cane and walker are not using the crosswalk. The more that Walden et al. publicize their problem with the supposed hazard of the 2-way aspect, the less of a problem it becomes. Duh. I’m surprised those gently-jaywalking elderly women got past that child with training wheels without being killed. I agree with Molly. The more people see these sorts of totally normal and entirely innocuous and lovely images, the more they will realize that the lawsuit is not only frivolous, but selfish and mean-spirited. Notice the first picture. The woman is cycling in the lane for car doors. Typical. Gee that’s really safe. Time to take some of these images and make posters and start putting them up in shops up and down 7th Avenue. Let folks in Park Slope know what some very privileged people are trying to do to the rest of the neighborhood. Agreed! The lawsuit is kind of functioning like a massive education campaign regarding conflicts between bikes and pedestrians. Everyone now watches out for each other even more than before. DOT has clearly manipulated the data to downplay tricycle accidents. 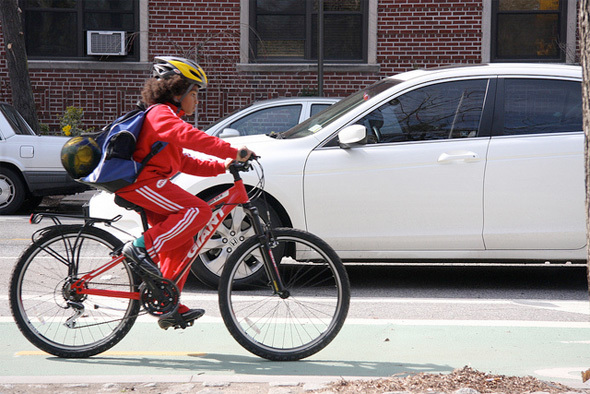 Yeah, it’s dangerous to ride a bike at the same speed as a five-year-old on training wheels. She’ll never be able to react to any door zone activity in front of her, and no one can see her coming. =v= Don’t these people know they’re supposed to be cowering in fear, instead? They’re obviously all suffering from the insidious effects of confirmation bias, according to expert psychologist Louise Hainline, sitting there on the other side of her spy camera trying to count all these bikes. This bike path is silly and all the folk who are supporting it don’t live in the area, Because if you did you would realze that there is a park, Prospect Park less that 10 feet away with an entire 2 lane road dedicated for bike. All you are doing is contrubuting to the congesstion problem by taking up the space that extra cars could use!! Clearly DOT tipped off these elementary school children in order to inflate ridership counts. How do we know these pictures aren’t photoshopped? 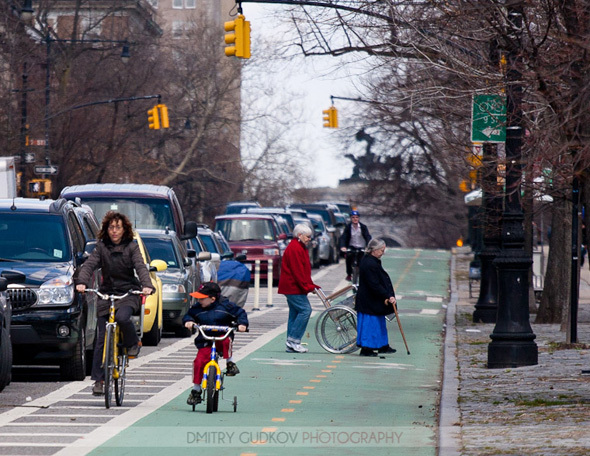 What we hate even more than the bike lane itself is the attitude of self-righteous sanctimony and entitlement exuded by bikers like those in these photographs. You can just tell they think they’re better than we are! Well, I live near the park and have for many years. I’m a driver and I don’t think the congestion has been increased all that much. 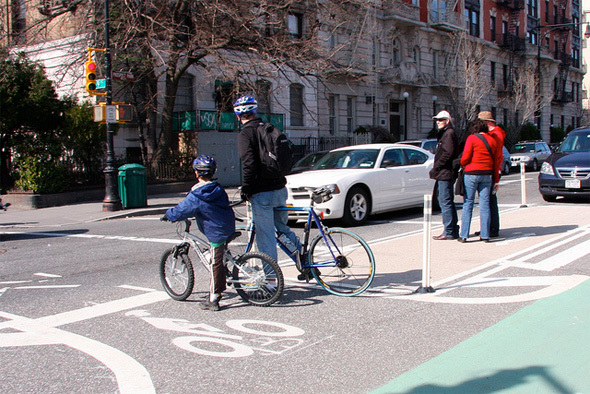 I’m also a cyclist and a pedestrian, and I am happy that the speed of cars on PPW is reduced. It feels much safer to me. Also, the park is not an option for riding north, because it is dangerous and illegal to bike against traffic in the park. Also, it always seemed so crazy dangerous how fast cars used to drive on PPW. The fact that they move a little more slowly now seems like a good thing. Because clearly the basis of our public policy is how many cars we can possibly shoehorn into our neighborhoods. The last pictures shows that the storm/sewer grates are installed in a way that can trap a bike wheel. 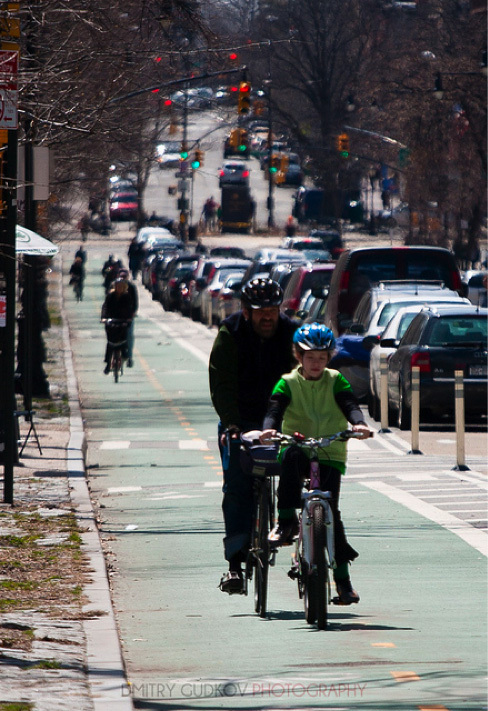 Some supporters may not live in the area of the Prospect Park West bike lane, but 1) travel on it to the park, 2) travel on it to school, 3) travel on it to work, and 4) travel on it do shopping. The existence of a road isn’t to serve those who live on or near it. It’s part of the transportation system that moves people around the city, and should be mode and user agnostic. 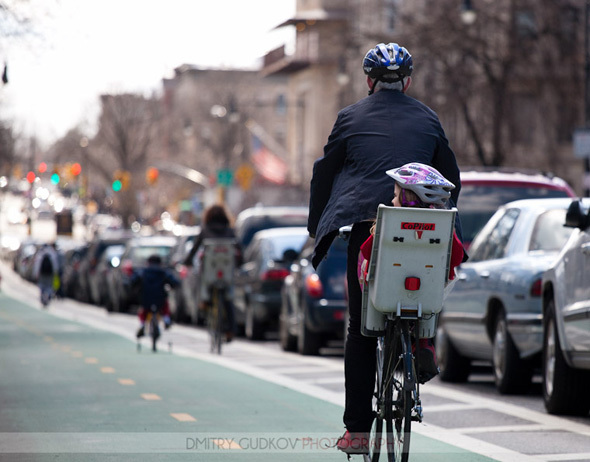 Can you talk more about this supposed spy camera pointed at the Prospect Park West bike lane? @Caribman – Actually, the opinion polls of the area AND of Windsor Terrace (where the lanes lead) show a solid majority of support. Going through the park is a lovely option for those living a bit more to the east, but there is that 1:00 curfew. I try to pedal as sanctimoniously as possible. They are grids — it looks like slots in the picture, but they’re not. Apparently Gibson Dunn Lawyer Jim Walden wants to sue this out of existence so badly, he’s willing to do it pro bono. Beautiful! Pictures like this show why we choose to live here. I suggest you also use ppwbikelane as a Flickr tag, not just a group, so people can add more photos without waiting for you to add them to the group. I agree. Marty just doesn’t get it though. He thinks that if we make it safe to bike in Brooklyn we will scare people away because it will be too hard to drive and park. Like it wasn’t hard to drive and park before. He just doesn’t understand that people move to brownstone Brooklyn because they want to be in an urban environment where they don’t need to use a car to get around. Nice use of link bait in the URL and page title, this page is no. 5 in the google results for “Gibson Dunn Jim Walden” tonight. And now it’s the fourth Google hit for this lovely lawyer Gibson Dunn Jim Walden. I’m going to drop in from time to time to comment on this thread just to keep the page as alive as possible. The fact that Walden wants to hook his wagon to Schumer’s wife to bolster a nomination as U.S. Attorney tells me all I know about his pompous limelight motive for his “pro bono” work. Give me a break. Schumer is such a disgusting coward. I resent the fact that he lives in Park Slope.